Germany’s DAX was higher on Wednesday, closing at 10205.21 for a gain of 147.90 points or 1.47 percent. The day’s gains followed European stocks higher as an exit by the U.K. from the European Union seems less likely. A survey from the Evening Standard by Opinium showed sentiment was higher overall towards staying in the European Union. Sectors leading gains for the day included utilities, food and beverages and telecom. Stocks higher for the day included E.ON, up 3.68 percent, Commerzbank AGO.N., up 3.67 percent and Deutsche Bank AG NA O.N., up 3.44 percent. Stocks leading losses for the day included Heidelbergcement AG O.N., down 1.00 percent, Vonovia SE down 0.20 percent and Adidas AG down 0.17 percet. The DAX volatility index was down 6.09 percent to 19.57. Bayer and Monsanto also continued to trade actively in market trading as Monsanto rejected Bayer’s $62 billion takeover bid but said it would be willing to negotiate. German based Bayer was down-1.75 points or -1.97 percent to 87.25 EUR. Monsanto was higher at $111.63 for a gain of 2.33 points or 2.13 percent. In other European markets on Wednesday, the FTSE 100 was higher at 6,262.85 for a gain of 43.59 points or 0.70 percent. The FTSE 250 was higher at 17,232.64 for a gain of 96.97 points or 0.57 percent. France’s CAC 40 was higher at 4481.64 for a gain of 50.12 points or 1.13 percent. The Stoxx Europe 600 was higher at 348.56 for a gain of 4.44 points or 1.29 percent. The Europe Dow was higher at 1571.34 for a gain of 26.69 or 1.73 percent. In Asia, stock trading was mixed. Japan’s Nikkei was higher at 16757.35 for a gain of 258.59 points or 1.57 percent. Hong Kong’s Hang Seng Index was higher at 20368.05 for a gain of 537.62 points or 2.71 percent. In China, the Shanghai Composite was lower at 2815.09 for a loss of -6.58 points or -0.23 percent. In India, the S&P BSE Sensex was higher at 25881.17 for a gain of 575.70 points or 2.28 percent. The Asia Dow was higher at 2619.25 for a gain of 58.05 points or 2.27 percent. U.S. market indexes were higher Wednesday. 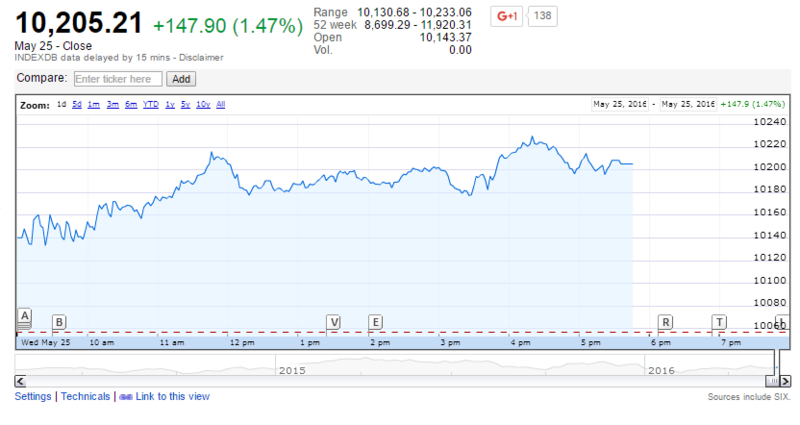 The Dow Jones Industrial Average was higher at 17,851.51 for a gain of 145.46 points or 0.82 percent. The Standard & Poor’s 500 was also higher at 2,090.54 for a gain of 14.48 points or 0.70 percent. The Nasdaq Composite was higher for the day at 4,894.89 for a gain of 33.84 points or 0.70 percent. Other notable index closes in the U.S. included the small-cap Russell 2000, higher at 1,141.02 for a gain of 5.72 points or 0.50 percent; the S&P 600 at 697.88 for a gain of 3.86 points or 0.56 percent; the S&P 400 Mid-Cap Index, at 1,481.20 for a gain of 9.71 points or 0.66 percent; the Russell 3000, at 1,231.34 for a gain of 8.44 points or 0.69 percent; the Russell 1000, at 1,157.12 for a gain of 8.11 points or 0.71 percent; and the Dow Jones U.S. Select Dividend Index, at 587.68 for a loss of 2.94 points or 0.50 percent.